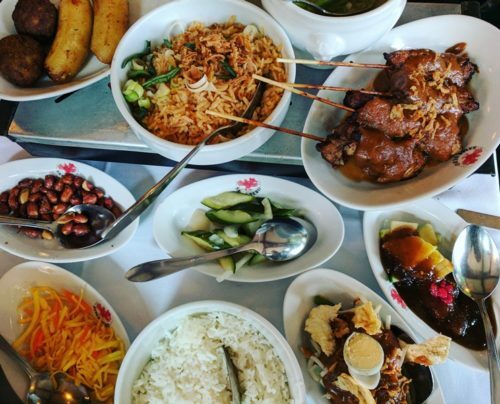 Amsterdam is known for its Indonesian food, so it’s quite often that I end up in a conversation with someone about the best Indonesian restaurants in town. I generally vote for Blauw, with Tempo Doeloe in second place (the food is great but the service can be awful), but there was one place I couldn’t with any certainty tell people was good or bad, because I’d never been: Sama Sebo. It’s apparently one of the oldest Indonesian restaurants in the Netherlands, having been serving customers from its kitsch brown-café location for over 35 years. So you’d think, after all that time, that they’d know when they’re doing. I set out on my Sama Sebo mission with a fellow food writer – we were both ashamed never to have been there, so we figured we’d put that right together. Barely even bothering to look at the menu, we ordered the rijsttafel. There was only one of them (which I took to be a good sign and, in any case, made the ordering process much easier) and it felt like the right yardstick by which to judge the place. After all, I’d eaten rijsttafel at Blauw, Tempo Doeloe, Jun, and pretty much every other Indonesian joint in town – if it ain’t broke, why fix it? We’d no sooner got our wine than the dishes started arriving – suspiciously quickly. It felt like we were part of a production line of tourists being fed our requisite dozen or so dishes before the next busload arrived. Because that’s the thing: Sama Sebo is in every guidebook, which implies one of two things: either it’s so good that everyone goes there, or it’s so bad that only the tourists go there. We heard very few Dutch voices at other tables – ‘nuff said. The dishes were variations on bland, cold, dry, and whatever the opposite of spicy is. I get that restaurants dumb down the spice levels for the western palate, but seriously – this was so dumbed down it was fake news. The pork satay was (reliably) about the best thing on the menu, but the other meat dishes lacked much of the flavour of warm spices that you’d expect from that part of the world. The gado-gado and green beans were limp, sorry shadows of their former selves, and the side dishes lacked anything to pep up the main event. The sambal with shrimp crackers was the only thing that didn’t disappoint. The rijsttafel itself cost us a hefty €31.50 each – presumably for the privilege of eating on the PC Hooftstraat in such a “historic” restaurant. With the wine (which was more or less the cheapest on the menu), we spent €55 per person. This in stark contrast to an experience I had few days earlier, when a group of 15 hungry hula hoopers descended on Toko Toorop in Rotterdam without a reservation. We inhaled as much rijsttafel as we could manage, plus a soft drink, for under €15 each. There was flavour; I was happy. I didn’t think it was possible to screw up a rijsttafel – at any price – until I ate at Sama Sebo. But one thing’s for sure: it won’t be appearing again in any guidebooks I write.